Home › Massive 8000Pc Premium Loom Bands Refill Kit 20 Beautiful Rainbow Colors & St.. Massive 8000Pc Premium Loom Bands Refill Kit 20 Beautiful Rainbow Colors & St.. MASSIVE 8000pc Premium Loom Bands Refill Kit 20 Beautiful Rainbow Colors & Styles Including Neon Glow in the Dark 500 Clips Included! Fill up your Loom Bands Organizer today! Lab Tested 100% Latex-Free, Phthalates & Lead FREE! Super Strong Stretchy Premium Loom Rubber Bands - No Smell - ZERO Bad Chemicals - Make advanced rubber band bracelets without them breaking! 100% Loomy Bands Satisfaction Guarantee! SOLID COLORS: Brown, Lilac, Black, Pink, Lime Green, Teal, Light Green, Red, Blue, Navy, Hot Pink, White, Yellow, Bright Red, Purple, Orange, Green, Grey, Light Teal, and Dark Green! A few assorted colors are Glow in the Dark! 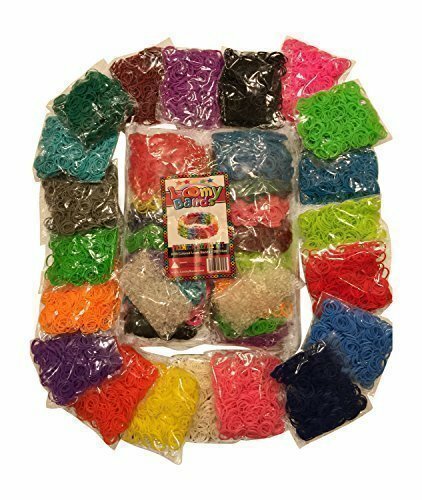 Includes 500 Rubber Bands Per Color and 500+ Clips - Premium Stretchy Rubber Bands - Compatible With All Rainbow Loom Kits and Organizers! Make thousands of rubber band bracelets! LOWEST PRICE, TOP QUALITY, UNIQUE VARIETY - Search for Loomy Bands or checkout our store for dozens of different refill kits including TIE DYE, NEON, and GLOW IN THE DARK! 100% Money Back Guarantee! We know our products are the best and stand behind them. Purchase with ease of mind that if anything goes wrong, we will gladly sort things out for you with our excellent customer service! LOOMY BANDS - THE BRAND NAME THAT EVERYONE LOVES AND TRUSTS We stand behind our product. Our customers trust us to provide the highest quality rubber band refills for their Rainbow Loom kits. Prior to packaging, all our products are tested through an ISO 9000 Certified state of the art testing facility. Rest assured, our products will NOT have any of the bad chemicals other loom bands have included lead, phosphate, chromium, and mercury among others. Oh yea, we don't smell like that other brand either! We have the highest rated brand name on Amazon for all Loom Band associated listings. Do I really need to say more before you purchase your Loomy Bands kit today?! 100% Genuine Loomy Bands - Only Buy from Authorized Retailers!